Bob Vancho got off to a bad start in this 1989 game for rookie Helena. In his first season as a pro, Vancho had given up nine hits by the fourth inning and saw his team down 4-0, according to the book Stolen Season. Vancho finished that year with a 6.04 ERA. He went on to finish two more professional seasons. He made it to high-A, but he didn't make it higher. 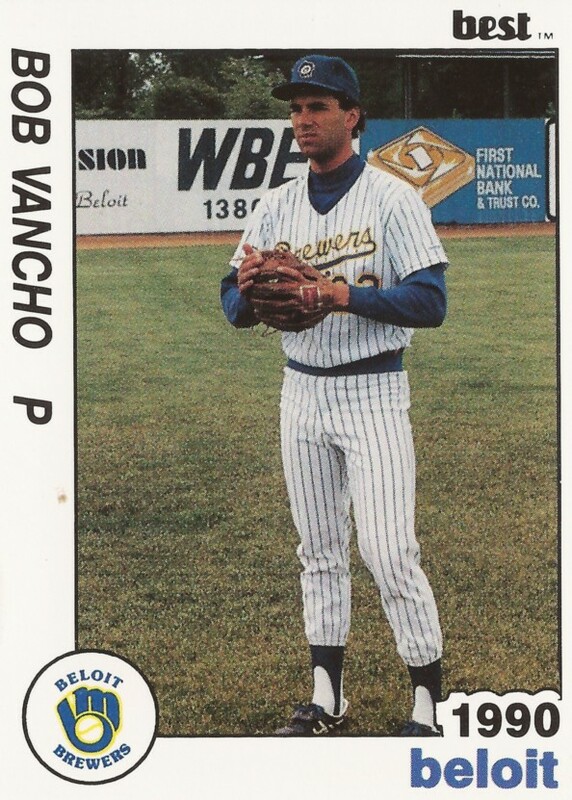 Vancho's career began that year in 1989, taken by the Brewers in the 23rd round of the draft out of Housatonic Community College in Connecticut. He played his high school ball at Trumbull High in Trumbull, Conn.
At Trumbull, Vancho singled in an April 1984 game. He won all-county honors in 1986. With the Brewers, Vancho started at Helena. In 10 outings, eight starts, he gave up 30 earned in 44.2 innings. He also went 1-5, with 38 strikeouts. He moved to single-A Beloit for 1990. In 32 outings, two starts there, he posted a 2.99 ERA, won two games and saved four. Vancho played 1991 at high-A Stockton. He got into just six games, all in relief. He gave up seven earned in 12 innings, ending his career.